69 MORE Reasons I love Israel! Well, kids! It's been ages since the last time I blogged. If I had a dollar for every time someone asked me "When are you writing a new blog post?" I'd have... like 40 dollars. And most of that would be from my mom. But here I am, back in action, special for the best holiday of the year- Yom Ha'atzmaut! I can't say that nothing has happened in my life since September 2016, of course it has. But nothing that moved me to write a blog post, I guess. But now that I'm back here, maybe I'll stay! Aliyah starts with excitement and new and different and then a few years in, it's normal. It's your life. Sure, the bank is always an experience, but you've already been to the bank 100 times! So hopefully I can get back into making quality content on this blog- even if I have to just make stuff up- just kidding! 1) I love that I could watch the American presidential election go down from the sidelines, because if I lived in NYC I know I would have been completely immersed. And probably gone crazy. 2) I love that I've met my mayor six times. 3) Unlike my family in NYC, I love my mayor. 4) I loved watching everyone running the Jerusalem marathon in different colored t-shirts denoting worthy Jewish charities. 5) I love that delicious kosher options are exploding all over Israel-so many that visiting friends don't even know where to start and need to plan return trips to try them all. 7) I love that Israel wants to help the Jewish nation grow- providing IVF and fertility services for women who are struggling to conceive. 8) I still love the vibe of the shuk at night- a learning about my history and culture with the graffiti-ed murals painted on all the stalls. 9) I love the National Israeli Baseball Team, who came out of nowhere to make the whole country so proud when they rocked the World Baseball Classic. 11) I love how Israel won 2 Olympic (bronze) medals and the country celebrated more than America and her 121 medals ever could. 12) I love how excited Israelis are about Ama're Stoudemire- they love basketball and America so no matter what he does here for his team, he's a hero. 14) I love the unity I'm seeing from our ally, the USA. I'm excited for the strengthened friendship Nikki Haley and David Friedman seem to be spearheading. 15) I loved seeing the desert bloom this winter as the South hosted the Darom Adom (Red South) festival. 16) I love how handy and well-equipped Israeli guys are- they can pitch a tent, start a fire, change a tire and make a mean poika (kind of a beach stew) without breaking a sweat. 17) I love spending Shabbat in Tel Aviv! I know, right? I have the privilege of having shabbat dinner with 150 young professionals of all stripes and then enjoying an incredible Shabbat day kiddush every time I go! 18) I know it might seem odd, but after many years, this year I went to my first Henna- twice! I love Hennas! I love the pageantry and the food and the music and the culture of my Sephardi brothers and sisters. 19) Speaking of smachot- I love Israeli weddings! Most of them may not be as lavish as the ones in the States, but they are so beautiful! The backdrops, the views, the mix of guests- every wedding holds the potential for the best night of the year. 20) I love photo magnets! Apparently this hasn't caught on in the US just yet (I think you do photo booths?) but it's super fun to get photo mementos of being all dressed up with your friends and blanketing your whole fridge in magnets. 21) I've said it before but I love wine festivals! And since last year, I've discovered that Herzeliya also has a white wine festival- so that's basically a dream come true! 22) I love the normalcy that comes with living here almost 3 years. Life here now is normal, and I love knowing that I'm where I'm meant to be. 23) I love that I live in the center of Jewish world- it's so fun always bumping into someone you know from back in the day or getting to see friends and family from the old country when they make a visit here. 24) I love the left- wing Israelis. I know that seems odd coming from me, but defending my position and my ideology in a productive and meaningful way both opens my mind and strengthens my own beliefs. 25) I love that the rhythm of the country is based on Judaism. Weeks, months and years- Israel moves to a Jewish beat. 26) I love that losing your wallet often ends with its return and your faith in humanity rejuvenated. 27) I love how here in Israel, my third cousins are just "cousins." I feel just as close to them as I do my first cousins back in the States, because they have taken me into their family so fully and lovingly. 28) I love that Tinder in Israel is basically JSwipe and Jews are able to meet other Jews and start Jewish families and have Jewish babies. Makes me smile. 29) I love ending a fun night out with a 3 AM shwarma. 30) I love that even the graffiti is Jewish- Na Nach Nachman Me'uman! 31) I loved the way the country stops on Yom Hazikaron and Yom Hashoa. A lot has been said about it, but I agree. It's beautiful and important. 32) I love how different Yom Hazikaron is from Memorial Day in the States. I love that Israelis consider it one of the holiest days of their year and grieve so fully for their loved ones. It hits home for everyone here, and it's palpable. 33) I love Yom Ha'atzmaut! Don't get me wrong, July 4 is super fun but for me it doesn;t compare to Israeli Independence Day. And the celebrations are non-comparable too- Israelis GO WILD for their tiny country built on miracles! 35) I love that little kids will tell you we must save water "for the Kinneret"
36) I love that this country actually utilizes the Hebrew (lunar) calendar! In the US, I probably couldn't even tell you the lunar month. Here, you can write the Hebrew date on your checks! 37) I love that Israelis are called Sabras- prickly on the outside but sweet on the inside is the perfect fruit-based analogy. 40) I love when Birthright season begins- I pray now more than ever, Jews in the diaspora will see how incredible Israel is and spread the word. 41) I love Wine Wednesday. 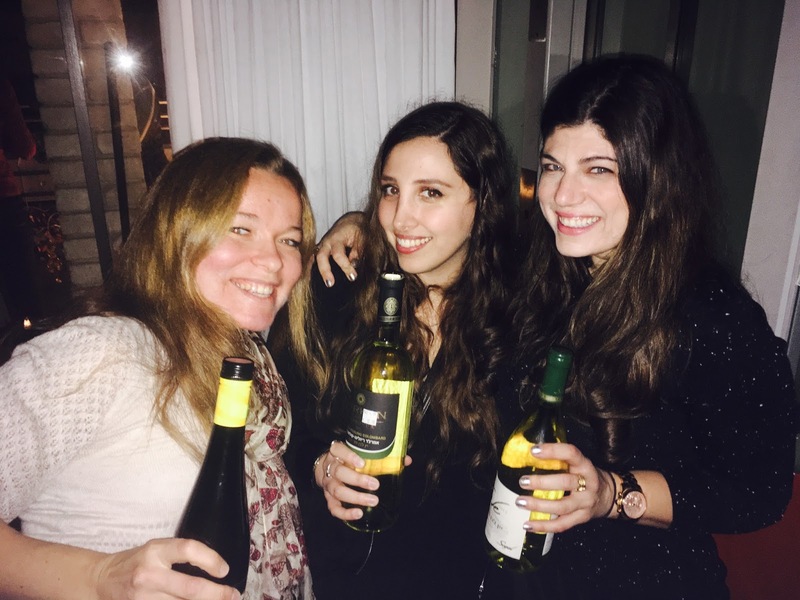 It's a charity initiative in Tel Aviv where young professionals get together (Usually on a gorgeous rooftop) to raise money for a worthy charity and drink wine with friends. It's the best way to give back! 43) I love when people say that I'm so lucky that I live here, and I get to tell them that they too can live here! And the government will even give them money to do so! 44) I love that Israel revived a dead language. What was for so many year only utilized in Torah study is now a thriving and ever-growing language representing the Jewish homeland. 45) I love that cab drivers will always have a guy for you. It is amazing how they can truly see how perfect Dudu and I would be for each other after 7 minutes in a cab. 46) I love the sign on the bus that says what day of the Omer it is. 47) I love having one day of chag. When I lived in the States, I swore the extra day made the chag extra beautiful. I lied. Make that one day beautiful. 48) I love that Aroma gets in on Jewish holidays like giving gelt on Chanuka and funny face wrapped chocolates on Purim. 49) I love the aggressive love Israelis show you once you finally establish that it is, in fact, coming from a place of love. It's like a country full of people who want what's best for you, whether or not you want the same. 50) I love that Shabbat dinner isn't just for the Orthodox here- that so many Israelis consider this beautiful custom an important tradition. 52) I love that the buskers here play Jewish songs. 53) I love the siren before Shabbat, letting you know the country is about to slow way down. 54) I love the Bar mitzvah celebrations in the Old City- a cacophony of shofar blowing and bongo playing accompanying the 13 year old and his 50 closest family members and friends. 55) I love that Israelis call their friends "neshama" or "soul." 56) I love borrowing money from someone behind me on the bus and having them tell me to give it to tzedaka instead of paying them back. 57) I love that the municipality decorated the side streets of downtown Jerusalem all summer, making our beautiful city even more so! 58) I love the Israeli folk dancing in public places- Israeli senior citizens staying fit and young by cutting a rug on a Tuesday evening. 59) I still love the light rail- even when it gets held up for 17 minutes for suspicious objects, it's still a super quick and comfortable alternative to the bus and it has made Yafo street pedestrian and therefore an excellent place to stroll. 60) I love that I have the ability to connect with other Israelis anywhere in the world. Whether is was my pub-crawl guide in Amsterdam, my waiter in Paris or the owner of my bagel store in NYC, being Israeli gives you an instant connection to other people around the world. Israelis are a roaming people, but it's certainly special to find a piece of home so far away. 61) I love Jerusalem stone- its is strong, and beautiful and everything in this city is composed of it. Every time I see it in the States and hear how hard it was to get it and how expensive it was to import it, I think "My city is just covered in the stuff!" 63) I love that the Israel haters bother me less- I live here, I see the good, I know the truth. I can see for myself how wonderful it is, I don't need their approval or acceptance. And I'll never get it any way, so why be upset about it? 64) I love how people say "Shabbat shalom", not "Have a good weekend." This may be due to the fact that essentially our whole weekend is shabbat, since Sundays are workdays, but I prefer to see the Jewish beauty in the concept. 65) I love how there are a bazillion native English speakers, but no one ever seems to ask us to proofread their signs or menus! I wait patiently for the day when someone posts a job opening seeking "translations proofreader." Then my aliyah will be truly perfect. 66) I love how this is a country full of Jewish mothers, which means that pretty much everywhere you go, someone in looking out for you and worrying about you. Makes ya feel good. 67) I love how we call Israel "Ha'aretz- the Land" and anywhere outside of it "Chutz La'aretz- outside the Land." 68) I love how when I had a bit of trouble coming up with so many things, everyone had a suggestion which made me fall even more deeply in love with this place. 69) I love how now that this is my home, I get to find new things to love about it every day! Thank you for reading and feel free to add your own reasons! Looking forward to another fantastic year in Israel, awaiting the day when you join me and together we can celebrate Israel's 70th- next year in Jerusalem!